Informing the designs of architects as diverse as Peter Zumthor, Steven Holl, Hans Scharoun and Colin St. John Wilson, the work of Martin Heidegger has proved of great interest to architects and architectural theorists. The first introduction to Heidegger’s philosophy written specifically for architects and students of architecture introduces key themes in his thinking, which has proved highly influential among architects as well as architectural historians and theorists. This guide familiarizes readers with significant texts and helps to decodes terms as well as providing quick referencing for further reading. This concise introduction is ideal for students of architecture in design studio at all levels; students of architecture pursuing undergraduate and postgraduate courses in architectural theory; academics and interested architectural practitioners. 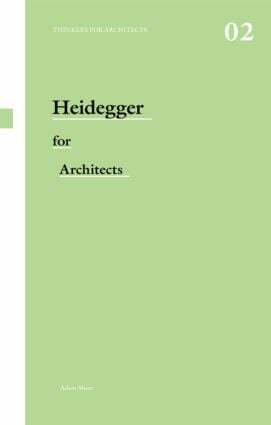 Heidegger for Architects is the second book in the new Thinkers for Architects series.